I thought I’d dig up this one from the archives. My #25RandomThingsAboutMe from back in my chemo daze of two-thousand and late. This has been on my #ToDoList anyway, since reading #lovewarrior cover to cover the day it arrived in the mail. Cuz Glennon Doyle Melton wrote about her list of 25 random things in it. I am going to throw down a new list (cuz life. it haps. and we change and evolve. or at least hopefully we do. so i doubt i will come at it exactly the same since i’m not exactly the same as i was 7 years ago.) But first, I wanted to check in with what I wrote back then. Did you write a list of 25 random things about you way back in the day too? 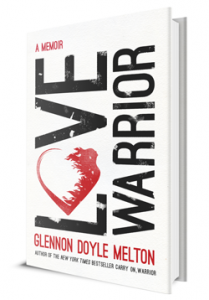 Also, HAVE YOU READ LOVE WARRIOR YET? 23. I am rarely random. For example, I usually think through what I’m about to say, rephrasing and such, about 3-5 times before I say it. Sometimes, I think about what I’m about to say to the point that it becomes so concrete that I think I’ve already said it. Then I sit there waiting for a response. Then I figure I said something to make you mad or something. 2. My kids are the sweetest hearts of my heart and my hub has been true to the in sickness and for worse part of our vows which has been hard on him and humbling for me. 9. I keep Hershey’s Chocolate Candy Bars and a jar of peanut butter in my nightstand. Also a pencil (and sharpener and a thesarus) and 3X5 cards for writing ideas or lists that hit me in the middle of the night. And a sweetart tin and supply that I sometimes take when we go out to see a movie. (We go to see movies A LOT, and I almost always get popcorn, but only sometimes take my sweetarts.) Also, whatever I’m reading. and a dictionary. And a crossword puzzle book is either on mine or Dave’s depending on who ended up filling in answers last. 17. I LOVE to play tennis. My license plate says EAT SLEEP TENNIS. I have a decal on my side window that looks like a tennis ball broke it. I can see it out my side rear view window, and smile every time I see it. I also have a tennis ball hanging in my garage that my mini likes to park under. I live right behind the tennis courts in my neighborhood and my boys made stairs going down the hill for me while I was having all the surgeries in the beginning of this cancer thing. 170 is the tennis channel on my tv. Someday I would like to plan a year of traveling around the world from slam to slam. 5. I am an INFP, according to the Meyers-Briggs personality profiling. So is Fanny Price, one of my favorite Austen characters. And in my opinion, Jane Eyre is too. I love all that personality profiling stuff. Although I don’t think you should put anybody in a box with it or anything else. I don’t do boxes. 14. I like to write sonnets. I like to write, period. But I’m very fond of sonnets. I have a Shakespeare bust that sits on my desk. A candlestick holder I got made of wood shavings from the Globe. I wear a small gold hoop like he wore, which I bought at the Folger Shakespeare Theatre in D.C.
4. Since Amanda has stolen my guitar off me, I’ve been thinking about getting a new one and picking it back up and trying to learn some of the worship songs we sing at the Vineyard and other songs I like. Also I’d like to write some of my own. 3. During chemo I found that I have a birthmark on the base of my head that looks like a cluster of grapes, which I think is very cool. And I’d like to think of it as one day becoming a glass of pinot noir when it grows up. 6. I love to cook with loud music in the background and a glass of wine in my hand. What’s usually cooking in my house is garlic and onions and some pasta (the house fave is spag carbonara-rachel ray’s recipe tweaked the tiniest bit-I think we’d be great friends). the wine on tap is generally a pinot noir, but we like to try lots of different wines and I have a great relationship with the woman who owns the wine store around the corner. currently playing on my IPOD is a chemo mix I have going as my soundtrack while I’m fighting cancer and dealing with chemo. 11. I drive a cooper mini which I call Rocinante (Don Quixote’s horse), and love that all mini drivers acknowledge one another in passing, and often park next to each other. It is a fun club to be in. One time, at the movie theatre, I left a note on the windshield of another mini we parked next to, saying, my mini likes your mini. When I came out, there was a note on my mini’s windshield that said the same thing. 16. I liked driving on the other side of the road in England, and think this says a lot about me. 24. One of my regrets in life was being talked out of climbing up the Eiffel tower and taking the elevator. I need very much to go fix that when I go watch the French Open someday. 8. I think gargoyles are cool. Also the fact that I have one of each of the state quarters. 21. Once, my dad took me to the riverboat and I won $1000 bucks at craps. 15. I have just gotten to a point in my treatment, where the tearing down of chemo is done, and I am so happy that the building up time is at hand. But I feel really impatient because my body can’t keep up with all the places my mind is jumping, especially as regards to regaining my fitness. The spirit is willing, and quite cranked up and raring to go, but the body is so freaking weak. 18.I want to have a coffee shop/book store named St. Udio’s someday. All the coffee mugs will have ink sketches of the saints of my coffee shop: St. upid will have a dunce cap on; St. ump will be short and, well, stumpy; St. ick will look like a stick of course. St. udio will have his tongue in his cheek…. You get the picture. 25. To me, coffee is the alpha drink and wine is the omega. Although I am not against having a glass of wine with an omelet in the morning or a cup of espresso with a biscotti before bed. I really don’t think coffee and wine should be put in boxes anymore than people. The important thing, is balancing the stimulants and depressants. 1. I am trying to figure out what to do with my second lease on life. 20. I would like to live in a warmer climate, where I don’t need to own a coat, where I could play tennis outside all year long, where I could take long walks in the sand after dinner everyday, and sleep with the window open so I can hear the waves. 13. I like to play Scrabble and do crossword puzzles and Scramble on Facebook. Basically I love words and playing with words. And writing. 10. I liked when my tennis opponents used to tell me I reminded them of Justine Henin. I think women’s tennis is not the same without her. And I wish I could’ve seen her play in person. Tried to last summer in Charleston, but she withdrew from the tournament, which really bummed me out. And then she retired before the U.S. Open, which bummed me even more. I also think we would be great friends. 12. I had to use a little stickie pad with the numbers 1-25 written on it to make sure I could use them in a random fashon; but even still, it’s quite possible that I messed up. And I’m too lazy to double-check.